Geographically: An important factor for many advertisers is selecting stations that focus on specific locations. With a range of national, regional and local stations covering most parts of the UK, radio is highly flexible geographically – providing opportunities for all types of advertisers to precisely target important locations efficiently. Demographically: commercial radio consists of a wide range of stations with a variety of content and playlists attracting different types of audiences. 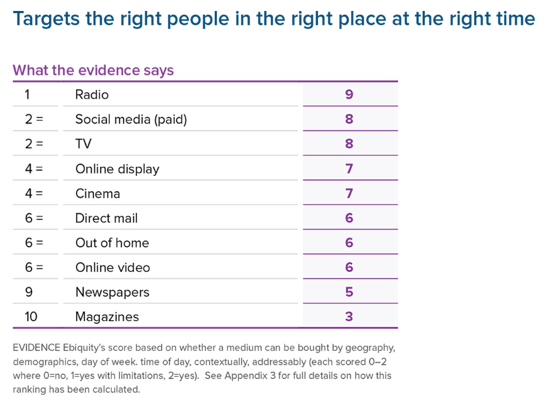 RAJAR data allows advertisers to analyse which stations are best for reaching their specific target audience. Consumer context: Research demonstrates that reaching people at relevant times can help enhance cut through and effectiveness of a campaign. As radio is available in a wide range of devices and doesn’t require primary attention, listeners often use radio to accompany a range of tasks and activities across the day, from the school run to working/studying through to childcare, allowing advertisers to target audiences in specific contexts. Search for relevant examples in the Radiocentre Case Study Finder. This government ad targeting car drivers (link to COI Speed Bet ad) is a great example of how effective this approach can be on radio. Addressablility: with more radio listening taking place through connected devices, some radio stations are now able to offer individualised personal data-led targeting of listeners to their streamed content. While still relatively limited in scale this is an important and growing element of the commercial radio offering (links to DAX and Bauer In-stream web content).